We hope you enjoyed our lunch trip around the world, and perhaps found inspiration to try new foods at your own dinner table! 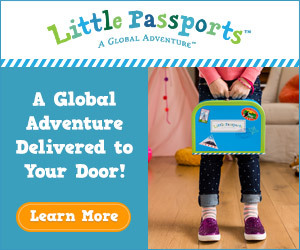 You can inspire your child to learn about other countries with Little Passports. Check out their World Edition subscription packages. Thank you for this interesting post! Didn’t grow up here so this made me reminisce about my childhood school lunches! Very interesting. I think it is fun to see what other kids are eating. A good idea is having a multicultural night a few times. Let the kids pick a country – or even a different state – and try one of their foods. Interesting how Japan and France are very nutritionally concerned. I’ve heard of places trying to ban vending machines or only allow certain items in them. I think we need to be more nutritionally focused but to be careful of how far it is enforced. Great recipes…I will try some. How cool! I read a book recently about how food for a week differs around the world – very interesting to read how different it is across the world! I wish they would take fresh and nutritious into consideration with our American school lunches! They say they do, but everything is frozen and their meal plans are catering to kid’s taste rather than teaching them what’s good; capitalism is in our schools too. That was so interesting! Thanks! This is interesting. My oldest just started school and I’m trying to make her healthy lunches everyday. This was a fun article.Most of the democratic countries in Europe and Asia take school food and their Parents take great care in what they eat at home.I wish we would begin to follow their example. I would like to try the school lunches in France. This is a really interesting post. I wish I’d lived in France growing up, sounds like lunches there are the best.